Bitcoin TA - summary of analysts - 23. July 18steemCreated with Sketch. RSI on all timeframes up to daily is at 70 or above (close or at overbought). Lets see if we close daily over 7'664 (MA128 daily, November 2017 top). Next major resistances are 7'780 (Mid line Bollinger Bands weekly) and 8'280 (MA50 weekly). We reconfirm the 6'800 or 7'000 level in a pull back gathering strength for another move up. Alternate: Bull flag is forming - that brings us directly to next resistance level at 8'300 from here. Quarterly chart: We are almost done with 1-4 correction. October / November could be the bottom. Monthly: Flipped from red to green. That can be good or bad. 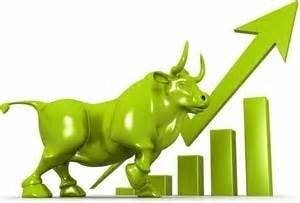 If next month trades above the current that could be bullish. you need to get above 9'000 be green though. Weekly: Still in 7'400 range. We got a price flip. We are coming on to a death cross. We had a good week which came off the 9. We might pull up to the death cross. Lets see if we make it there - this would be a clean short trade. That should be around end of month or beginning of next week. SAR are taken out - that is bullish. But we had that also in 2014 before reversing. Bollinger band are to far spread for a typically bottom. You want this to be narrow a the bottom. Daily: We have major resistance at 7'600 (even from last year). The MA 128 turned us at 10'000 it might turn us here - that resistance is serious. We have a bullish flag pattern - the target is 8'300 - which would bring us at the range of the death cross. 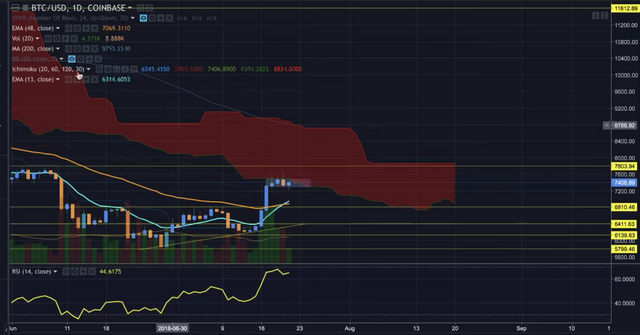 Bitcoin price prepare to a retracement by Butterfly "Sell" Pattern towards 7.000K - 7.050K area. Todays trend is neutral. Trading between 7'050 and 7'800. He was thinking of a move within a triangle but that seems to be off the table. 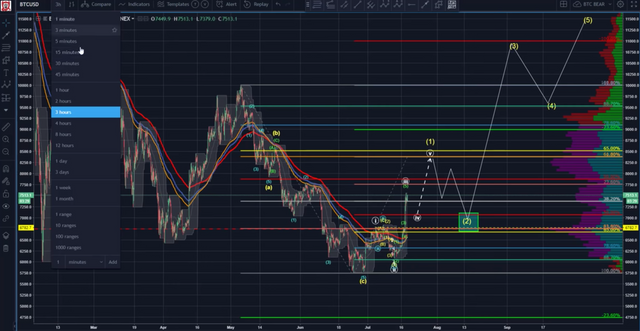 Rather he sees the current move to be either end of white wave 3 or C leg of yellow wave 4. If so, this is the most probable best case. It would form a cup pattern, possibly with a handle afterwards. 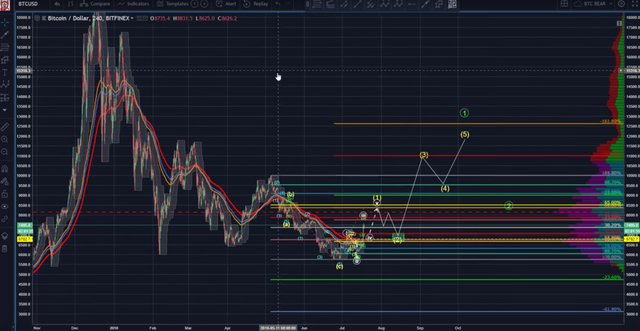 This move could bring BTC up to 13'200 for wave 1 or X. 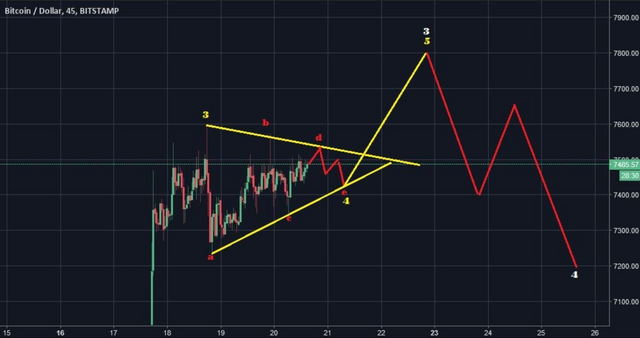 If it's wave 1, we will likely see any other correction but not a triangle. 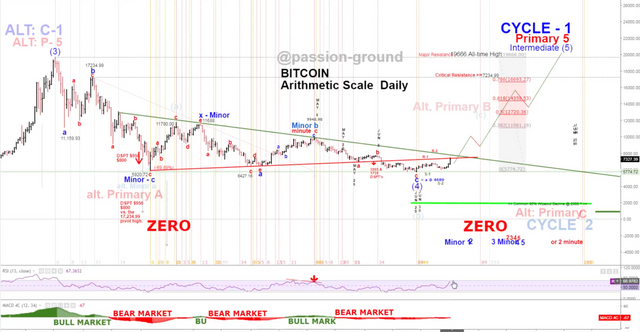 If it is wave X though, a triangle is very likely due to the rule of pattern alternation. We would have a ZigZag for W, an expanded flat for X and a triangle for wave Y (red). Here we are, and yet – it still ain’t over till’ it’s over… …the BEAR MARKET that is. Bearish on the higher level. Next turn month is August. Daily at his R1 line and gets rejected so far. We are rapidly moving towards RSI overbought. 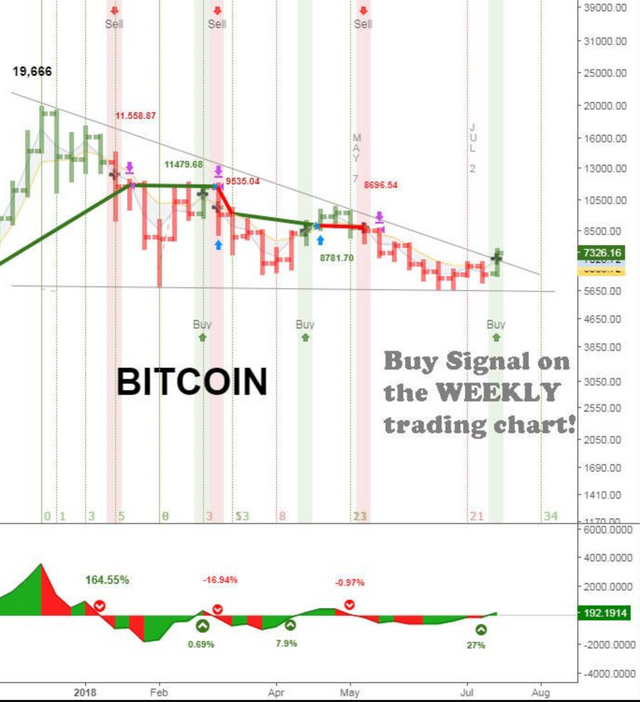 Weekly - we are moving into a buy signal - long term. We are about breaking out of the downtrend (log chart). We are in a descending triangle and breaking upwards. After wave 3 is completed we fall to the 0.382 level at 7'066 completing wave 4 and move as wave 5 to 8'060 level. That would be a strong indication for a now wave 1 higher degree and a trend change (towards bullishness). We move up to the 8'000 area completing a ABC correction as wave 4 of 5 waves down of the C wave. That would lead to the 5'200 - 4'800 target zone. 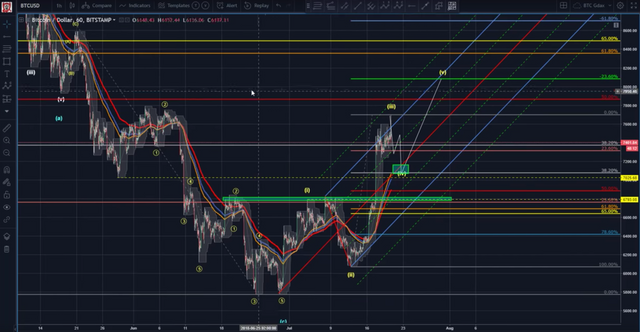 He sees that the current move was a 5 wave move to a one and we are looking at a deep 2 which leads towards 4'390 (0.786) and than to a wave 3 with much higher prices. He sees lots of positive signs for the bullish case. 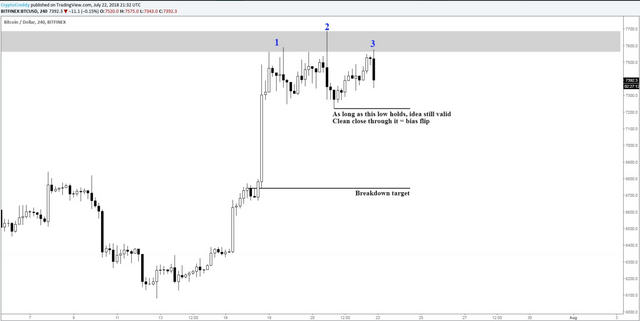 Expected that we are correcting towards 7'100 before moving higher towards the 8'300. Than he expects a bigger correction towards 7'000 area confirming a higher low. That would be very important and supports the bullish case strongly. If that gets to be true we are probably up to the races towards all time highs. See bigger picture below. SAR has been hit. That is his only point of bullishness. Bollinger bands are very wide and we are below mid-line. We would need to get above the mid-line and close above 7'780 - to get a bullish signal. If we would get that - we would need to get to the upper bollinger band channel at 9'500 to continue strength. Volume on weekly is still trending down. Moving averages (weekly) are moving to the downside. 2 - 7 - 14. We are above short and mid-term. We are above the first two ones but we are below long term and that one is heading down. Also intermediate is still moving down. That signals a neutral to negative chart. RSI came a bit up - for him that could be interpreted as taking breath for further downside as we have never been oversold. Also we have not gotten back to last peak. He is also not expecting us to. MACD is getting better "negative" but we are still negative. He is impressed that the SAR is taken out - but that is his only long term indicator that he is using which is positive. The rest is neutral to negative and he expects this move to slow down and turn soon. He has positioned itself still in cash and is convinced that he can buy BTC below 5'000 at some time in the future. He sees that alt-coin money - especially form eth - is flowing into bitcoin keeping us up. That weakens the ETHBTC price. 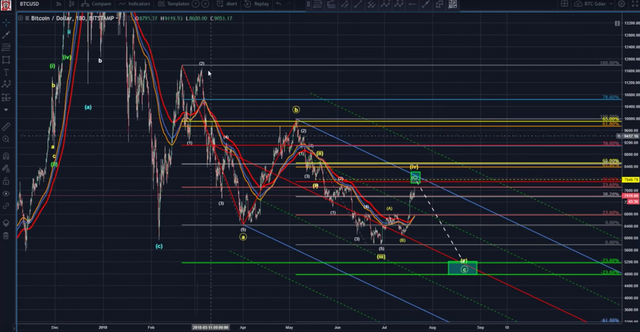 Furthermore he expects that as soon as it escalates towards a drop oft ALT/USD ETH/USD that this will create a panic and bring BTC to the long expected break below 6'000 price level. The basis, relative strength, the timing indicators all say it is time to pull the trigger and risk 1st and 2nd quarter lows. Yes, if we break it will be hard but that is fear. . . everything else says this is a low risk time and place to be a buyer. Always have a plan & know when it's wrong. 4d bitcoin is moving sideways - very unusual for bitcoin. We are moving in a channel (2.5% range). He sees lots of positive signs. 1hr: volume is picking up a bit on green candles - red candles are less. That is typically before pumps. Bull flag ist showing signs of strength. Ishimoku cloud resistance is concerning him though - that is why he is not taking any positions. EMA 13 and 48 daily golden cross supports bullish signs. Also broken up through the log chart down trend. 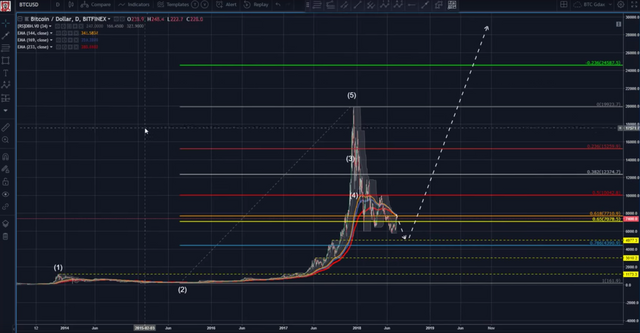 Only few whales make this graph as what they want ..whatever may be our analysis ..
Tyler Jenks' analysis is always very interesting, but I don't like the use of the Parabolic SAR for the crypto market. Using a trend indicator for a market that most of times doesn't have a trend but just spikes, doesn't really make sense to me, but for the rest, perfect analysis. Yeah, I can understand, but it shouldn't be an excuse. 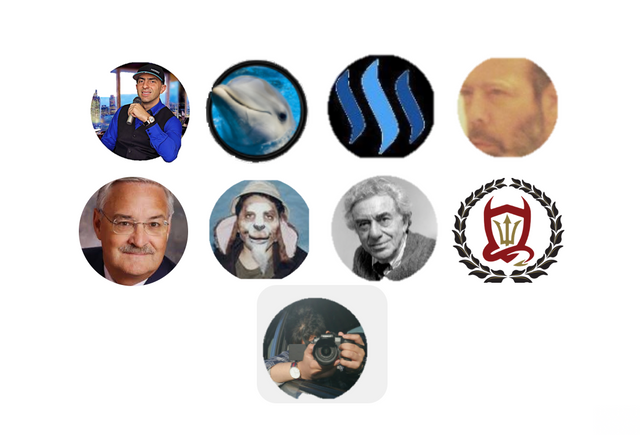 I also started only last year with Cryptocurrencies, but I don't use exactly the same setups that I use for other financial markets. Anyway, he must have his good reasons to do so! @famunger looking at the current market scenario I can say that if bitcoin cross 8000 with a good volume then it will go up but if it goes down then can go down till 6800-6900. Do you agree ? I really like this compilation of yours that you're doing :) keep up!